The Halcyon Quick-adjust harness sets a new standard in recreational and technical BC systems. The Halcyon Quick-adjust harness sets a new standard in recreational and technical BC systems. The Cinch can be used with single or double tanks and allows easy harness adjustability while avoiding quick-release buckles and dangling webbing. Simply push or pull the webbing and your size adjustment is complete. This quick, easy-fit system allows divers to size a snug harness without compromising easy removability. It is also ideal for student training and rental departments, or for divers that wear suits of varying thickness. The system is easily adjustable in or out of the water, making it ideal for convenient, in-water equipment removal. The Cinch is also very effective during emergency situations. 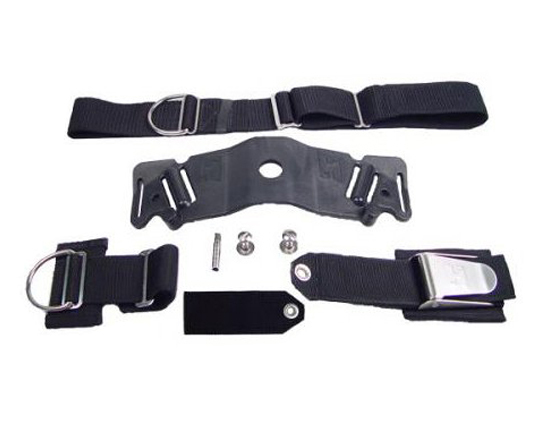 Kit includes: cinch adapter plate, 12′ of replacement webbing (not shown in photo), ACB Weight Pocket Adapters, D-ring assembly, Light Retainer Assembly, Stainless Steel bolt kit, quick-adjust crotch strap, and double tank bolt extenders.